This week, I decided to play around with my new collection of L'Oreal HIP eyeshadow duos. HIP was very easy to find in most drugstores in New York, with about 25 combinations to choose from. They retail at US$8 (excluding sales tax, about S$10.60) each, which is much cheaper than Singapore where they cost S$18.90 each. They're even more of a steal if you can get them during a buy-one-get-one-free promotion. 208 Sassy is a taupe brown paired with a smoky green. 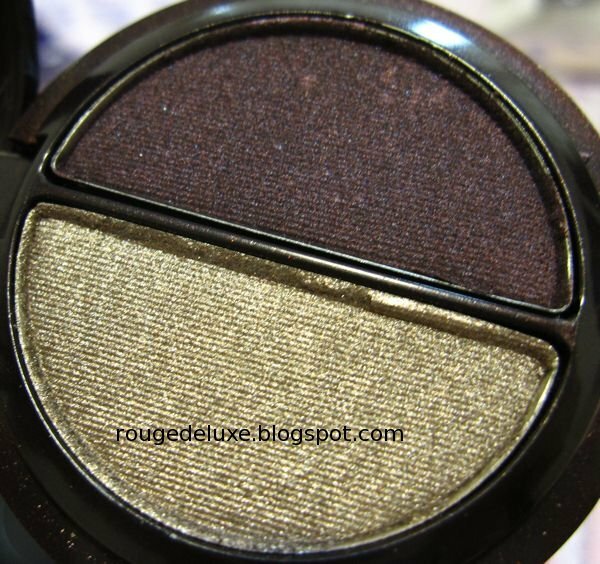 Several reviews on MakeupAlley pointed out that the taupe is a dupe for MAC's Satin Taupe. The smoky green shade applies quite blackened without much of a bright emerald or teal flash. 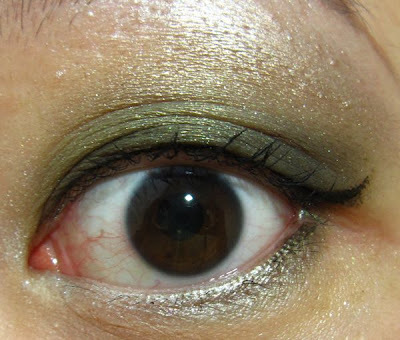 It is actually quite easy to wear as it's not as harsh as a jet black eyeshadow. 510 Electrified seems to be quite a popular duo with a lighter silvery taupe and smoky plum. This belongs to the "Metallic" group of HIP duos. Fortunately, the finish is not frosty. 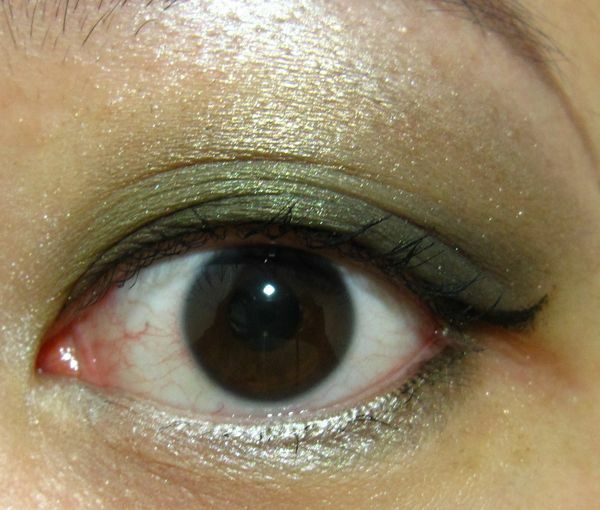 For this look, I used Urban Decay Primer Potion as the base with the taupe shade from Sassy from the inner corners to the middle of the upper lid and the green shade from the middle of the lid to the outer corners. Next, I applied the dark plum shade from 510 Electrified above the crease, and a metallic light beige shade from Dior Sky Glow over the browbone area and at the inner corners. 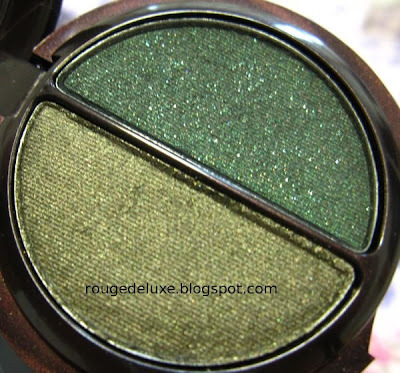 Like the earlier batch of HIP duos that I reviewed, I was impressed by the good colour payoff and smooth texture of the eyeshadows. They are a breeze to apply with the included sponge applicator and have a lovely glimmer without being too powdery or falling all over the face during the application process. The only flaw is the bulky and cheap-looking pot packaging with the silly double compartment. If they had dispensed with the bottom compartment holding the small sponge applicator, the pot would be much slimmer and more compact. One also needs to be careful not to drop these as they seem to break quite easily. I saw many shattered duos that were still sealed in plastic in the shops. 306 Gunmetal is quite an odd name for a green duo as one normally associates the word with dark grey. 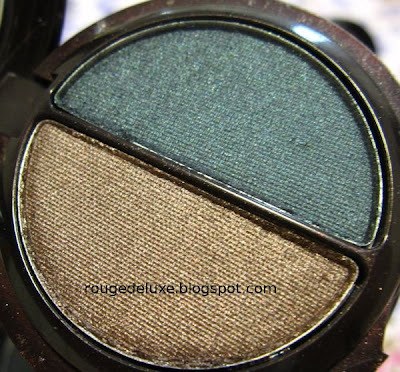 This is another "Metallic Shadow Duo". Using Beauté de Kosé Eye Fantasist GR751 Dew Green as the base, I applied the metallic smoky olive shade from the inner corner to the middle of the upper lid and the dark emerald shade from the middle of the upper lid to the outer corner and along the lower lashline. 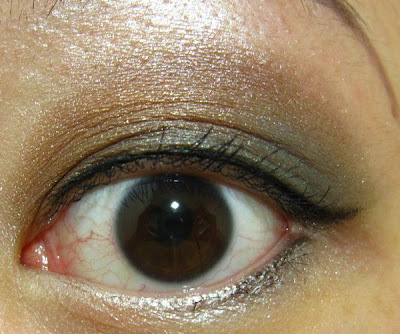 Next, I applied the silvery taupe shade from Electrified above the outer half of the crease, and a metallic light beige shade from Dior Sky Glow over the browbone area and at the inner corners. I was expecting the dark emerald shade to have a brighter tone as it has green sparkles sprinkled throughout but it turned out to be more ashy than I had expected. For both looks, I also used HIP Intense Eyeliner #320 Dark Sky, a velvety matte jet black from the latest Midnight Muse collection. 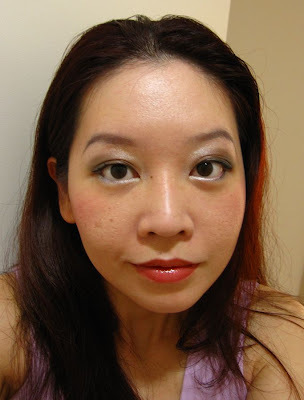 While I liked how the eyeliner glides on with minimal dragging and lasts well throughout the day, it's not good at creating the slim upward flick at the outer corners of the eyes, so I ended up using my usual Heroine Make Smooth Liquid Liner to touch up the corners. I hope that L'Oreal decides to bring in more of the HIP line and make it permanent in Singapore as the eyeshadow duos feature more interesting shades than the conventional drugstore selection and offer good quality at a very affordable price. 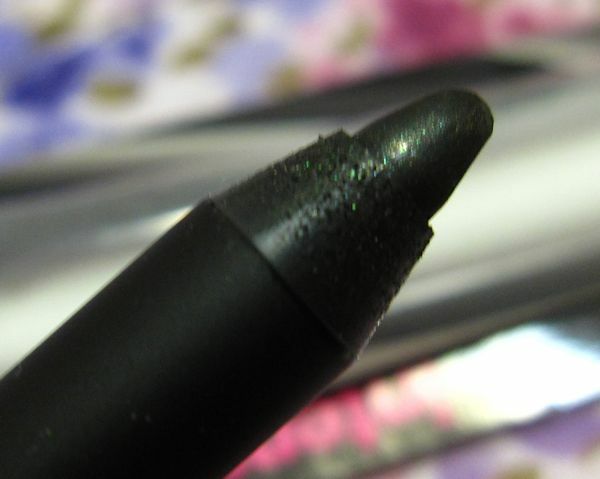 I like the HIP Intense Eyeliner too, but I also find it difficult to draw a nice flick in the outer corners. Loreal HIP is kinda overpriced in Singapore. I bought the HIP Intense Eyeliner for USD 10 and "buy one get one 50% off", so about USD 7.5 each. Hi Iris! Love your lip colour! You look great in this red lippie! May I know what did u use? 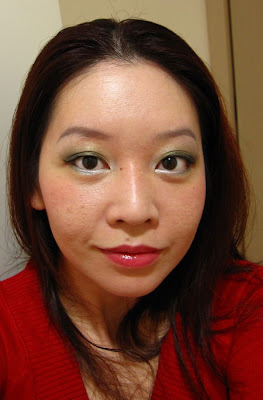 Iris, your 2nd FOTD looks so festive paired with your scarlet sweater...bring on the holiday cheer, yeah!! 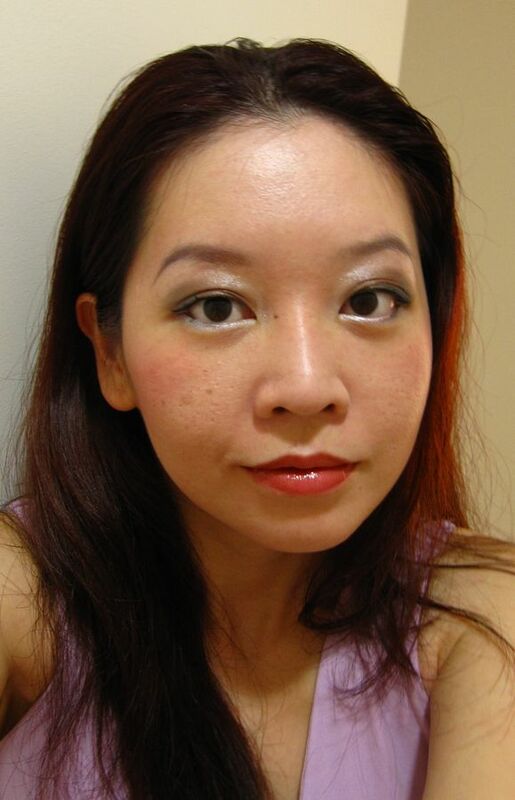 I'm using Addiction Lipgloss in Azalea in the 2nd FOTD (with the red sweater). Thanks! That's a good deal that you got on the HIP eyeliner! I don't mind paying a bit more than US prices but I just wish they would expand the line here. Ooh, ok, the Electrified and Sassy combination is LOVELY! I really like how it turned out!